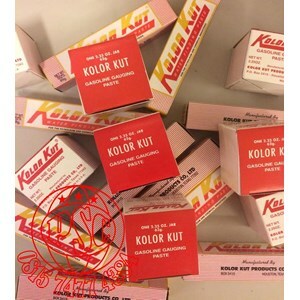 GENUINE Kolor Kut Gasoline Gauging Paste, Made in U.S.A.
For checking the depth of Gasoline, Diesel, Biodiesel, Kerosene, and many other fuel oils in fuel tanks. The product is not so effective with Alcohols - because the alcohols evaporate off the dipping tape quickly returning the paste to its original state. Kolor Kut gasoline gauging paste is the only gasoline paste approved by the US Military. It is designed for gauging levels of hydrocarbons. It should always be applied "sparingly" direct onto a dip stick or dipping tape at about the point where the level is expected. As a contact product it would usually instantaneously change from pink to red on contact with hydrocarbons. Heavy oils require a few seconds of contact. It is a one off action paste and repeat dips will require a fresh application of paste. Low levels of paste are miscible with hydrocarbons.The paste is not designed to be disturbed and should not be used in a sample. It would be best practice that any tank/vessel being sampled for analysis be sampled first. Analytical results are only as accurate as the sample itself. Gauging of the tanks with paste used sparingly should be the secondary operation.